Agile cross-channel attribution for both digital and traditional marketing, across any online and offline conversions. The Fastest Solution with the Fastest ROI. Actionable Insights to Immediately Improve Performance. Persistent, Continuous Guidance to Stay Ahead of the Market. The fastest speed to value, going live in a fraction of the time compared to multi-touch attribution & marketing mix modeling vendors. The most actionable, detailed measures, guidance and recommendations- at ad and campaign levels- across both digital and traditional marketing channels. Delivering continuous, rapid model updates to stay ahead of the market. Agile analytic sprints produce ongoing, sustained lift. OptiMine cloud-based Insight platform automatically builds tens of thousands of models to accurately measure the contributions of all marketing channels and ads, and delivers a rich and robust set of insights, tools, reporting, dashboards and data feeds to guide you to the best marketing spend decisions and performance lift. Top-down and bottom-up insights in one platform, one modeling approach, and no voodoo math to merge multiple approaches into a "single answer". No more silos and point solutions by channel. Understand how ALL of your channels interact and contribute to sales performance. Insights delivered to you using modern, mobile-friendly technology and tools. Bottom-up ad and campaign level details, guidance and recommendations. Even down to individual keywords. Team collaboration and budgeting scenarios with guidance to achieve the strongest results with your budget. It doesn't matter which channels you use to capture conversions- OptiMine can measure them all. Online, call-centers, agents, in-store, channel partners, dealerships, and just about anywhere else. OptiMine feeds consolidated, standardized and cleaned data back to you for use in your own internal reporting, dashboarding and analytics systems. Want to run self-service? No problem. Need support? We're here to back you with a team of deeply knowledgeable, seasoned experts offering strategic guidance and support. 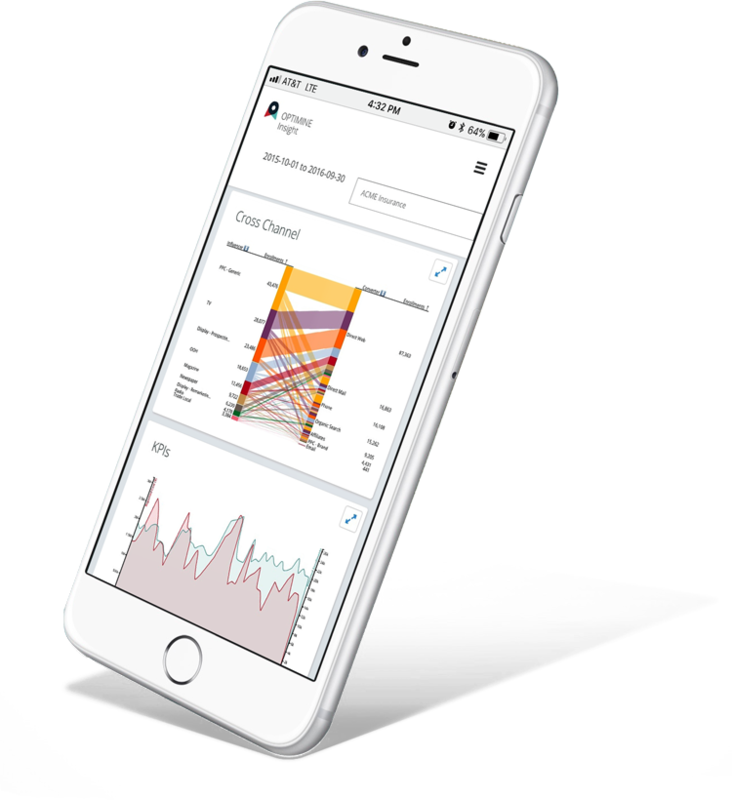 OptiMine combines machine learning, incredibly sophisticated algorithms, model automation, and cloud-based scale to deliver the most agile marketing measurement in the market. It starts with measuring and controlling for non-marketing factors impacting your sales. All businesses have factors that drive sales that have nothing to do with their marketing investments. The danger is that if you don't account for these factors, your answers will be wrong. OptiMine's models control for non-marketing influences such as seasonality, calendar effects, promotional pricing, economic conditions, market factors and more. This ensures you get the most complete and accurate measures of the true, incremental contributions of your marketing. Solutions like multi-touch attribution don't account for these factors and mis-state the value of digital ads. Why invest so much in your marketing only to get the wrong answers? Only OptiMine gives you the most accurate measure of each ad's value. OptiMine delivers real ROI in the form of sales increases, marketing budget efficiency gains, and more. Learn more about our clients' ROI and how OptiMine can help you. Marketing mix modeling vendors' models go stale over time, and are very expensive and time consuming to rebuild. Multi-touch attribution models are highly inaccurate, and don't measure the incremental contributions of all campaigns. Only OptiMine, via incredibly sophisticated automation, delivers fresh models and insights continually- to keep you ahead of the market. 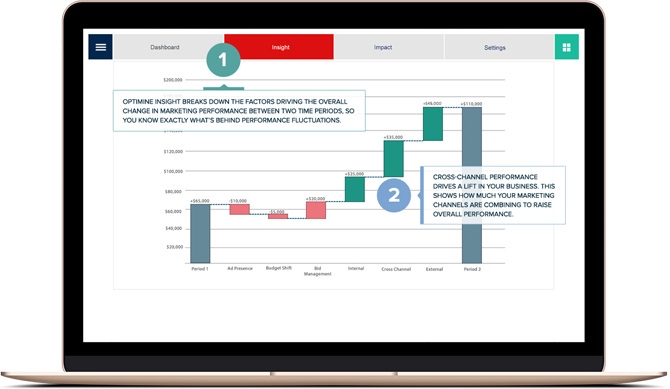 OptiMine is the best choice for brands that market across both digital and traditional channels and have conversions across many online and offline touchpoints, offering a far superior solution compared to marketing mix modeling, multi-touch attribution and so-called "unified" measurement vendors. Easy to deploy- no sensitive, risky PII. No cookies and tags. OptiMine is the easiest, fastest deployment in the market. Period. Incredibly flexible- OptiMine can measure any outcome, KPI or conversion metric you have. Want a different KPI measured? No problem. With marketing mix model and multi-touch attribution vendors, you have to start all over again, wasting time, money and precious resources. OptiMine provides both top-down strategic guidance combined with bottom-up detailed, tactical recommendations- all in a single, uniform modeling approach. "Unified" solution vendors that attempt to combine marketing mix models and multi-touch attribution suffer from conflicting guidance, math and methodologies that cannot be "unified", measurement gaps, and inaccurate measurement- hardly "unified" at all.